Have questions about research data? 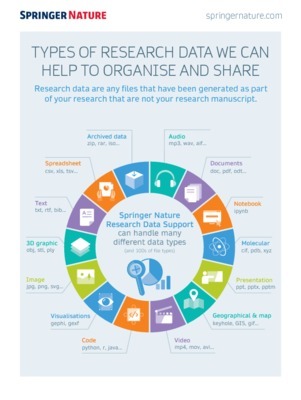 This poster provides information on the Springer Nature Research Data Helpdesk, a service that provides advice on queries relating to research data policies of funders, institutions and journals, finding research data repositories, and writing data availability statements. This poster will be presented at 13th International Digital Curation Conference in Barcelona, February 2018. To support authors, researchers, librarians and editors who have questions about research data and the publisher’s data policies, Springer Nature established a free-to-use Research Data Support Helpdesk. This service provides advice on a range of research data topics, including complying with the data policies of funders, institutions and journals; finding research data repositories; and writing data availability statements. It is independent of journal, book and conference proceedings editorial offices and does not advise on the peer-review process of specific manuscripts or publications. The Helpdesk was launched in conjunction with the Springer Nature standardised journal policies in June 2016, with the aim of supporting editors with implementing data policies, and helping authors comply with them. Up to October 2017, the Helpdesk has received more than 300 enquiries on a range of topics (see below for breakdown) with the majority being from editors asking about implementing data policies, followed by researchers asking about repositories, deposition and policy compliance. We recently surveyed the users of the helpdesk to get their feedback and found that overwhelmingly they appreciate this service being available and that it has helped them with their research data questions.